A time crystal gives Harry Mudd the ability to rewind time by 30 minutes, with him being the only one who is aware of the effect. Everyone else experiences those 30 minutes without noticing that everything happens again and again. Using this tactical advantage, Harry Mudd gradually learns to evade his pursuers and to operate the systems of the Discovery with the goal of handing the ship over to the Klingons. 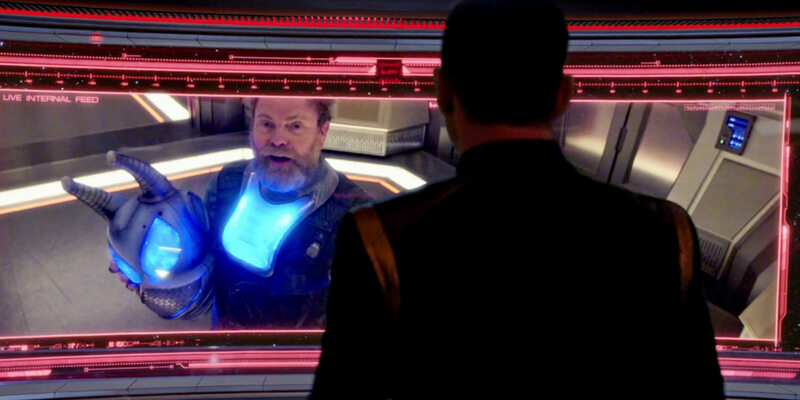 Lt. Stamets is the only other person who knows what is going on, thanks to his connection to the spore network. It takes at least 56 loops for Stamets and his crew to stop Mudd. The idea behind this story is very similar as that of TNG: "Cause and Effect". The difference in a physical and logical sense is that in the TNG episode time was reset in a causality loop, which may have lasted forever without human interference. 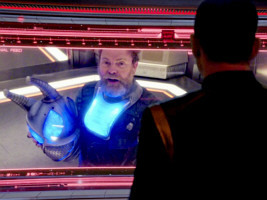 In the Discovery episode, Mudd triggers the reset on purpose in each loop (or it is triggered by his death). There is no causality loop in "Magic to Make the Sanest Man Go Mad" but "only" someone playing with the "time controls". It is clear that Mudd's crystal does not reset time in the whole galaxy or universe but just in a limited space around the Discovery. He wears a wrist device that seems to control the time displacements and obviously protects him against the effect. The displacement is triggered by Mudd pressing a button or by his death as it seems. The actual crystal is located in his ship that is hidden inside the Gormagander. This readily explains why it is necessary each time for him to get the "space whale" aboard the Discovery in order to pursue his plan, although he might have found better ways once he knew all controls of the ship he wants to capture. Yet, it also aggravates the problem of why the creature was beamed aboard each time, although Stamets knew what was going on. Had he managed to convince Lorca not to do it in just one of the many loops, Mudd may not have been able to carry on. Mudd in DIS: "Magic to Make the Sanest Man Go Mad"
Escape from the Mirror Universe in DIS: "What's Past Is Prologue"
After the escape from the Mirror Universe through the spore network the USS Discovery arrives in its own universe nine months late. It is not the first time that the time is a variable in the crossover from one universe to another. Something similar already happened in ENT: "In a Mirror, Darkly", except that the USS Defiant of our universe crossed over in the opposite direction, and wound up in the past of the Mirror Universe. The time travel arc related to the Red Angel spans several episodes of the second season. DIS: "Brother": Seven red lights appear simultaneously all over the galaxy, a phenomenon that, among other possible reasons, may be a sign of a temporal anomaly. There is no evidence of a time travel yet. A "new" signal (#1, actually one of the seven that reappears) leads the Discovery to an asteroid field where the crew rescues Jett Reno from the crashed USS Hiawatha and harvests dark matter. Michael Burnham sees the Red Angel for the first time. DIS: "New Eden": It turns out that Spock, in some kind of premonition, sketched up the signals before they appeared. When another "new" signal shows up (#2), it leads the Discovery to a remote planet named Terralysium with human settlements. Their ancestors were rescued by a winged entity from WWIII, some 200 years ago. The Discovery can avert a planetary disaster, pulling away debris from the orbit using the gravity of the dark matter asteroid. The Red Angel does not appear in person to anyone. DIS: "The Sound of Thunder": A third signal (#3) leads the Discovery to Kaminar, Saru's homeworld. A crisis arises when the Ba'ul capture Saru, who is considered dangerous because of his "evolution". Pike eventually decides to trigger that "evolution" in the complete Kelpien population. The Red Angel appears to Saru and his sister. Saru later muses that the Red Angel is a time traveler, as evidenced by the simultaneous appearance of red signals in different parts of the galaxy, by the tachyon residue and by the exosuit using a yet unknown technology. DIS: "Light and Shadows": This episode has the first on-screen evidence of time travels related to the Red Angel. Here, the appearance of the Red Angel leaves behind a temporal anomaly that the Discovery investigates. We can see a few "temporal hiccups" similar to the ones in TNG: "We'll Always Have Paris". Some of them are like echoes of events that already happened (such as Pike's discussion with Tyler on the bridge), some are flashforwards from the future (such as Pike's apparition of him shooting Tyler). The latter seems to indicate that the timeline is predetermined. Since it is not possible to control probes without being dangerously close to the anomaly, Pike and Tyler take a shuttle and launch a probe from there. The probe, however, reappears with upgrades that were done 500 years into the future. It is obvious that someone must have "abducted" the probe on purpose because it very unlikely that it would end up in the future by chance, and someone would decide to send it back just for fun. 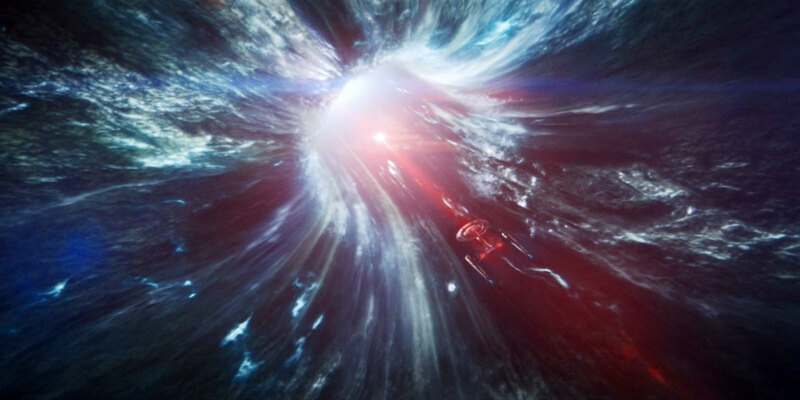 DIS: "If Memory Serves": It seems clear that the Red Angel is a time traveler, and Michael Burnham wonders why the entity would contact Spock, and if and how Spock could have a special perception of time. 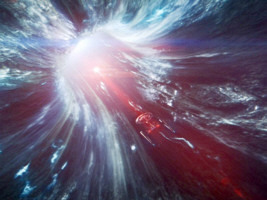 The Red Angel showed Spock the destruction of all sentient life in the galaxy in a possible future. 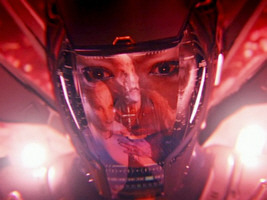 DIS: "The Red Angel": At this point, the theory is that Michael Burnham is the Red Angel, and that she traveled through time in an attempt to keep Control, the AI built by Section 31, from evolving, which would otherwise lead Control to destroy all sentient life in the galaxy. The crew devises a plan to capture the Red Angel, using Michael Burnham as a bait and exposing her to the poisonous atmosphere of the planet Essof IV. If she herself is the Red Angel, she would have to come and save her life because of the grandfather paradox. The Red Angel appears and can be held in place using a forcefield. But it's not Michael Burnham. The Red Angel actually is her mother. DIS: "Perpetual Infinity": Dr. Gabrielle Burnham was thought to have been killed some 20 years ago, when Klingons raided her lab (and Michael was sure she heard them kill her), but she actually managed to power up the time travel suit she and her husband were building and escaped. Her plan was to travel 10 minutes to the past, but she ended up 950 years in the future. Gabrielle Burnham says that she didn't create the seven signals. However, she mentions that she visited her daughter several times in her life, usually without her noticing anything, and ensured that she would be safe. It was her who saved the people from WWIII and transferred them to Terralysium and who arranged for the Discovery to encounter the Sphere. She also witnessed the evolution of Control, and was determined to prevent it from happening. The key to the evolution, in her view, is the data that Discovery obtained from the ancient Sphere and that would become the decisive step in the AI's evolution. All of her attempts to erase the Sphere data were unsuccessful. 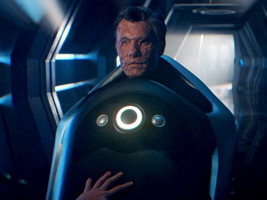 It is also impossible to delete the data from Discovery's computer, so the crew attempt to transfer it to the time travel suit and send it to the future where it can do no harm, an attempt that Leland, meanwhile infected by Control's nanobots, thwarts. Gabrielle Burnham disappears to the future again, the suit is gone too, and the data is still in Discovery's computer. DIS: "Through the Valley of Shadows": A new signal (#4) leads the ship to Boreth, a Klingon planet where Pike is greeted by Tenavik, L'Rell and Voq's son. Tenavik is grown up because of the time anomalies on the planet. Pike asks for a time crystal to pursue the plan to send the Sphere data to the future, but this comes at the price of him witnessing his own inescapable future, that he will suffer severe radiation burns and end up in a wheelchair. DIS: "Such Sweet Sorrow I": The plan is to destroy the Discovery to get rid of the Sphere data, but the data has taken control of the ship, disables the auto-destruct and raises the shields. Another new signal (#5) pops up at Xahea, the home planet of Po, who has devised a method to recrystallize dilithium and who also comes up with an idea how to power the time crystal. As the time travel suit was specified to work only with her mother's DNA, Michael Burnham is the only person who could tow the ship into the future, which would be a one-way trip. Many of the Discovery crew agree to join her. DIS: "Such Sweet Sorrow II": Section 31 ships surround the Discovery and the Enterprise, while the crew completes the new time travel suit. Michael Burnham tries to enter the coordinates 930 years in the future, but it is not possible. In order to fulfill what has already happened, she first has to travel back in time and create the five signals that are already known. The timeline is predestined much like in TOS: "Assignment: Earth" and TNG: "Time's Arrow". She has to rescue Jett Reno to have her engineering expertise, she has to go to Terralysium to find a safe harbor, she has to change the society on Kaminar to have their support against Section 31, she has to get Pike to acquire the time crystal on Boreth to be able to travel in time, she has to get Po's help to charge that crystal. After doing this, she is ready to travel to the future. And so it happens. Michael Burnham sends signal #6 as a beacon for the Discovery to follow, after which she, the ship and many of its crew end up some 930 years in the future. As a sign of her safe arrival, she sends signal #7 that the Enterprise picks up 124 days after her disappearance. The Red Angel arc is the arguably most complicated story ever told in Star Trek. Although "Such Sweet Sorrow II" wraps it up nicely and answers the ostensible questions, hundreds of problems still remain. Even if we leave out any questions of how the story may possibly fit with canon, it has numerous internal inconsistencies. The following will focus on the mere time travel related questions and will not discuss technical issues such as why the Red Angel suit is an omnipotent piece of technology (time travel, instantaneous space travel, cloaking, tractor beam to tow churches and starships, "infinite" computer memory, "incomprehensible" signal generation, unlimited energy once it's powered up). The first thing to put on record regarding the Red Angel arc is that there is essentially just one timeline. The crew of the Discovery (and the viewers) witness a single continuous timeline from "Brother" to "Such Sweet Sorrow II". There is no past incursion that would have interrupted history. At least, Michael Burnham never does anything that would change the past. Her timeline is predetermined. In this regard, the assessment in "The Red Angel" that she would come to save herself because of the grandfather paradox is not correct. Actually, if her timeline is predestined, she would not be able to die at all at this point of her life, no matter how exactly it is averted. Well, the result is pretty much the same anyway, and becomes irrelevant when the forcefield actually captures her mother. It seems to be somewhat different in her mother's case because in "Perpetual Infinity" Dr. Burnham says about her daughter: "I've seen you die a hundred times, and I'll see you die a hundred more." So she changed the timeline, and witnessed the effects during her many time travels. 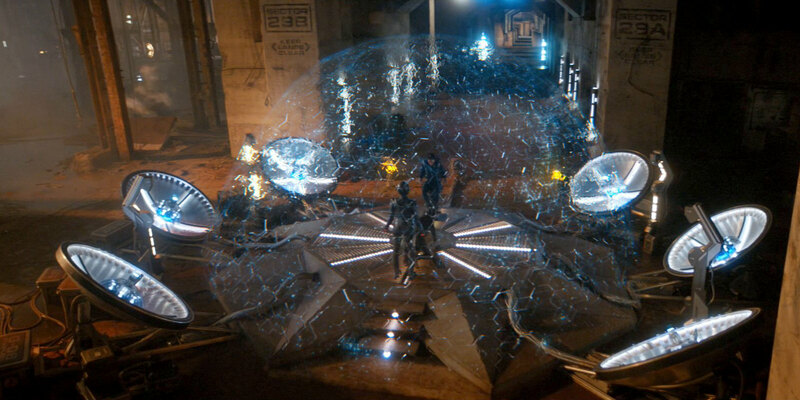 Dr. Burnham was responsible for changing Discovery's flight path so the ship would encounter the Sphere. The Discovery crew is not aware of this or any other timeline changes that may have occurred during the second season. On the other hand, Dr. Burnham also says that certain things can't be changed, and in her view it is almost inevitable that the AI will eventually acquire the Sphere data some way or another, become sentient and kill all life in the galaxy. 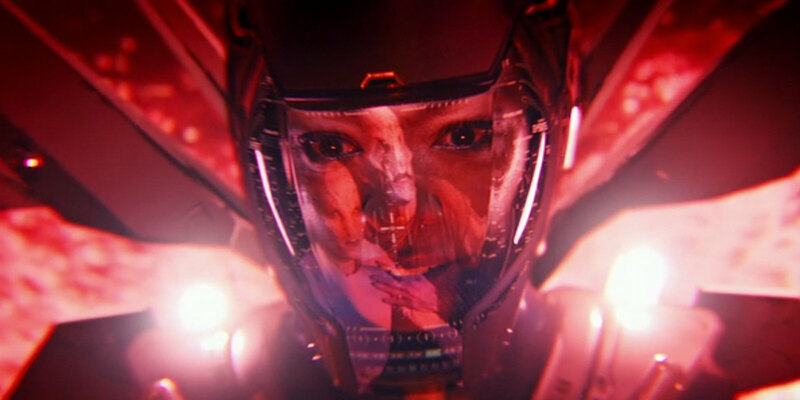 Capturing the Red Angel in DIS: "The Red Angel"
Burnham as the Red Angel in DIS: "Such Sweet Sorrow II"
There are actually two Red Angels: Gabrielle and Michael Burnham (both named for biblical angels). Gabrielle Burnham shows up in the flashback in "New Eden" when she saves the people from the church. She is said to have appeared to Spock in his childhood, and once again when she told him the possible future. We finally see her as the Red Angel when she is captured in "The Red Angel". A preliminary theory was that Gabrielle Burnham would appear together with one of the seven red signals (that she said she didn't create) whenever her daughter is in danger. In "Such Sweet Sorrow II", however, it becomes clear that Michael Burnham does not only generate the signals, but also appears as the Red Angel on these occasions: to herself in "Brother" and to Saru and Siranna in "The Sound of Thunder". Michael Burnham creates the seven signals, and most clearly the first five ones, in a predestination paradox. She knows by the time of "Such Sweet Sorrow II" that following the five signals was helpful for Discovery's mission, and she has to make sure retroactively that these signals would be created in the first place. As outlined in the introduction, a predestination paradox eludes the grandfather paradox because it is not possible to change the past. But it invokes the ontological paradox: Matter or knowledge may come to existence from nothing. 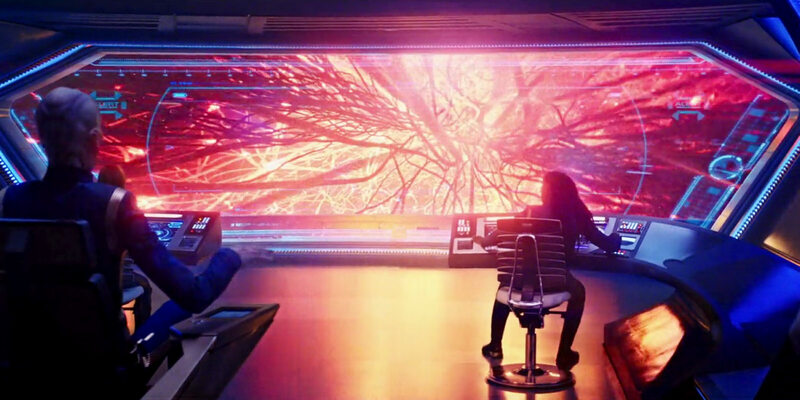 The occurrence of the ontological paradox is obvious because Michael Burnham couldn't be aware of the Hiawatha with Jett Reno inside the asteroid field before her own signal led her to this place. She couldn't know that her mother saved the people from WWIII and transferred them to Terralysium before her own signal showed up at the planet. She couldn't anticipate that the Kelpiens would "evolve" before it happened and I doubt she was aware of the time crystals on Boreth before the ship actually visited the planet. Also, she neither knew that Po had devised a way to recrystallize dilithium nor that she had been aboard Discovery before (Tilly evidently didn't tell Michael). The five examples of the ontological paradox in the story arc are rather "mild" ones. In its ultimate consequence, the Red Angel may just as well have given a superweapon to defeat Control to Michael Burnham, without the need to ever build that weapon! Considering that they both use identical technology, it is not plausible why time travels initiated by Dr. Burnham create new timelines while those performed by Michael Burnham don't. 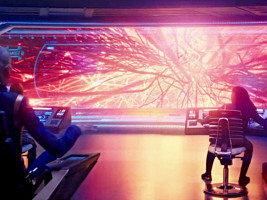 Temporal physics and logic in Star Trek has never been consistent, but there is no reason why they should vary even when using the very same time travel method. One possible rationale is that Gabrielle Burnham was pulled into the far future by accident and that she snaps back to that time like on a rubber band, whereas her daughter seems to have no problem to return to from where she started (the piece of debris in "Such Sweet Sorrow II") as well as eventually to open a wormhole for a permanent time travel. The rubber band effect is a new aspect of temporal phenomena in Star Trek anyway because so far a time travel resulted in a person to remain in a different time permanently. But rather than a fundamental difference in the involved logic, it is more likely just a technical matter. A wormhole that is not completely open may allow limited presence and interaction on the other side until it closes, which may give the impression of being pulled back. So it remains a mystery why Red Angel incursions sometimes change the timeline and sometimes don't. 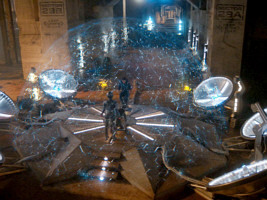 One more observation pertaining to the predestined timeline is that Michael Burnham is not allowed to enter a destination in the future in her freshly activated time travel suit in "Such Sweet Sorrow II". In the story, this is supposed to ensure the closing of the time loop because otherwise the known history would not have happened. Usually in such a kind of story, the circle is completed inadvertently. Data definitely didn't want to lose his head in "Time's Arrow II" so it would be found in the first part. But in Burnham's case a technical device, and not adverse circumstances, force her to go back. The suit was built according to specifications from outside the time loop, but can we nonetheless invoke the ontological paradox that the suit would need to enable its own creation? Has the suit been programmed in a way that it would notice that a predetermined timeline must be fulfilled? Does it even have the power to decide when to force it and when to be more liberal? Or did it just suffer an unlikely malfunction that was gone after the fifth jump to the past that was necessary, now finally allowing to go forward? And what would have happened if Burnham had decided not to travel in time at all? This all remains a big mystery. Regarding the timelines, the biggest open question is whether Dr. Burnham died on Doctari Alpha 20 years ago or whether she escaped. Both her daughter (who could hear it) and Leland (who found the corpse) can testify that Gabrielle Burnham was killed by the Klingons. It did happen. At least, it did happen in one version of history that both Burnham and Leland remember. The dilemma is that the very first time travel event that occurred in the Red Angel arc was that Dr. Burnham activated the suit and escaped to the far future. After that, she was not in complete control of the time travels. She could change the timeline to some extent, but she couldn't accomplish anything that would have saved her husband or that would have stopped Control from getting the Sphere data. But most obviously, she could not have caused a timeline in which she died on Doctari Alpha because at the time of "The Red Angel" she was clearly alive! There is only one way that this inconsistency could have and perhaps still can be resolved: Dr. Burnham must return to Doctari Alpha to be killed there. And even this would not be totally plausible, considering that her time travels are not predestined. No one could possibly remember seeing her dead before she really goes back to die. There are also still many unanswered questions regarding the signals. In "Brother", seven signals appeared across the whole galaxy before "new" signals (actually the same ones) started to appear one by one. We still don't know how and when the initial signals were created, and how they could appear simultaneously. One way to accomplish this would be to transmit two signals from each location: one "live" signal (at high warp) to be received by the Discovery, and one signal to travel back in time, precisely timed for the Enterprise to receive it together with the other six signals. This should have been addressed somehow. The seventh and last signal is sent by Michael Burnham from the other side of the wormhole, from the far future. When she promised to Spock that she would send that signal to show that she is safe, my impression was that she would do it while the wormhole was still open. But it actually appears 124 days later (and comes from the other side of the galaxy). How is that possible, without her performing yet another time travel? Travel to the far future in DIS: "Such Sweet Sorrow II"
Pike's destiny in DIS: "Through the Valley of Shadows"
One controversial aspect of the Red Angel arc is that when Captain Pike touches the time crystal in "Through the Valley of Shadows", he sees his own future, his accident that leaves him paralyzed in the wheelchair (as known from TOS: "The Menagerie"). 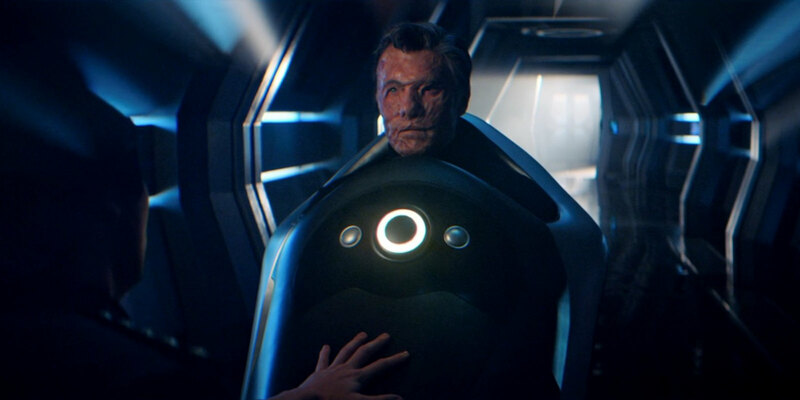 We knew it would happen (considering that Discovery is supposed to be canon in spite of everything), and now Captain Pike is aware of it too, which breaks the fourth wall. But Tenavik, the Klingon guardian of the crystals, tells Pike that there is even more about it: "But if you take the crystal, your fate will be sealed, forever." In other words, the very act of taking the crystal determines his fate and makes the accident inevitable. Anything that Pike may do to change his destiny will be useless. In "Such Sweet Sorrow II" Pike even volunteers to stay with the torpedo when it goes off, but Admiral Cornwell (who somehow seems to know of the future he saw?) says it is not his destiny and orders him to leave. So is Pike's destiny really predetermined? Considering that Michael Burnham experiences pretty much the same in her time travels using the crystal and that his vision of the future may be seen as the equivalent of a time travel, this may not seem like a big deal. But being the master of one's own fate is a principle that Star Trek so far was very proud of, and that is dropped for a melodramatic story about Pike's sacrifice (well, and to "sync the series with canon").